Perhaps you’ve noticed that the stained glass windows in your church look a little bit cloudy or murky. Or maybe the lead is turning a greyish-whitish color. Or, even worse, pieces of the stained glass are cracking or falling out of place. Either way, your stained glass is clearly in need of some TLC. But what do you do? Do your stained glass windows need minor repairs or would it be better to replace them entirely? Deciding whether stained glass repair for your Fort Collins or stained glass replacement is a better option truly depends on your situation. It’s important to take certain factors into consideration before you make a final decision about what to do. Once you’ve gained a better understanding of your options, you’ll be able to make the right choice about what steps to take next. Stained Glass Repair or Replacement – Which Makes More Sense? First off, it’s important to establish that stained glass repair in Fort Collins and stained glass replacement are two distinctly different processes. Stained glass repair involves fixing problematic issues with the condition and appearance of the existing stained glass through either onsite work or intensive off site restoration. 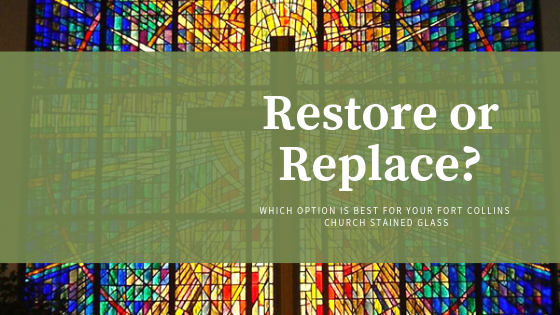 Stained glass replacement, however, means removing the current stained glass, getting rid of it in some way or another, and adding a new stained glass window in its place. In most cases, churches will try to save the existing stained glass with repair. However, repairs can get expensive, especially if a lot of labor-intensive work is required. But, if the stained glass is rare or valuable, the cost may be well worth it. However, not all stained glass windows are worth the cost of repair and restoration. Contemporary stained glass, especially, is often not considered to be extremely valuable, unless it was created by a notable artist or the pieces themselves are valuable. However, some churches may be moved by sentimental reasons to repair their stained glass, even if it isn’t very valuable in monetary terms. Which option is best truly depends on your situation. Either way, the most important thing is to address damages when they arise. Contact your local repair studio and have them inspect the stained glass and explain what options you have available to you. Then, you can present the information to your church board and make a decision from there. Are you considering stained glass repair in Fort Collins? Schedule an appointment to have your stained glass inspected. Contact our office today to set up a time for an onsite consultation.